“Let the soil speak, expressing the terroir and its vintage.” So says Michel Chapoutier, the seventh generation of this family business, started in 1879 by Polydor Chapoutier. It is under Michel’s direction that Chapoutier has emerged as one of the great names of the Rhône Valley. The company farms some of the regions greatest vineyards, including the three single vineyards of Hermitage, Le Pavillon, Le Méal and L’Ermite. But quality runs throughout the portfolio here, as does creativity. Since 1996, all wine labels have included a Braille version, not just a nice acknowledgement of blind wine lovers, but an homage to Maurice Monier de La Sizeranne, original owner of Chapoutier’s famous ‘La Sizeranne’ vineyards, who was also the inventor of the form of Braille widely used today. Like most of the medium-sized to larger producers in the Rhône, Chapoutier also buys in grapes, and the firm produces wines from up and down the length of the Rhône Valley. But this ambitious company also has outposts in the south of France (with wines from several appellations including Banyuls, Maury, Collioure and Côtes de Roussillon), and in Australia, with Domaine Terlato and Mount Benson. But whilst Chapoutier is clearly a large producer of many wine styles from diverse territories, his belief in his historic Rhône homeland – and the much more subtle differences in the terroirs of each appellation – is admirable. 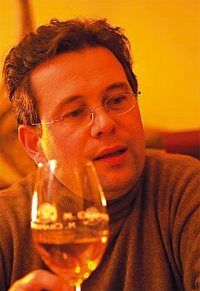 To further demonstrate this, Chapoutier has farmed all of his estate vineyards biodynamically since the mid 1990s, and in recent years has reined back some of the oak in his wines, though he still prefers smaller barriques to some of the larger casks used by some. I have just tasted through a selection of three of Chapoutier’s more modestly priced wines, including a very fine Côtes-du-Rhône, an excellent Saint-Joseph from the northern Rhône, and his Châteauneuf-du-Pape ‘La Bernardine’ from the south. The quality of these wines is really very good across the board, reinforcing Chapoutier’s well-deserved reputation. Winner of bronze in the Decanter wine awards, this cuvee is made especially for Laithwaites by Michel Chapoutier from low-yielding, old vine Syrah and Grenache. The excellent Rhône vintage of 2004 has given a wine with a deep, velvety crimson colour and a nose flooded with a voluptuous creamy berry fruit. There’s a juicy plum depth to this, but also attractive little violet and herbal notes that add interest. On the palate this has a thick-textured, very creamy mouthfeel, with plenty of mouth-coating black fruit, but all edged by a nicely tangy plum skin and cherry acidity, and a noticeable tannic grip and plenty of fruit concentration. A serious style of Côte du Rhône, and very good indeed – excellent at the price. £9.91, Laithwaites. Chapoutier’s Saint-Joseph ‘Deschants’, from biodynamically grown vines, is undoubtedly one of the best-known names of this appellation. Around 20% of this all-Syrah wine is aged in oak. It has a vibrant, crimson/black colour, and the nose offers aromas of kirsch, black cherries and a definite schisty minerality. Dark, charcoally notes and a hint of white pepper add plenty of interest to this fruit-forward wine. In the mouth this has a smooth, silky weight and concentration of fruit, with more cherry and blackberry flavours, but a really keen, savoury edge that is spicy and grippy, with crisp acidity and a roughening, plum- and cherry-skin edge of tannin. Staying cool and focused through the mid-palate, this well-balanced wine has a food-friendly darkness and savoury quality with plenty of spice. This will cellar for a few years quite comfortably. Excellent. £12.91, Laithwaites. 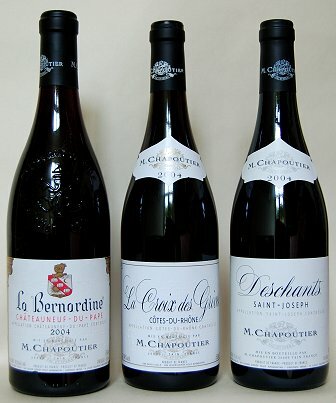 Chapoutier’s La Bernardine is 100% Grenache and has earned high praise from critics, including Robert Parker. The immediate impression on the nose is of concentration and intensity, with a dense, spicy, smoky blackberry fruit and a creamy, glossy sheen of old oak. There’s a plummy depth here, in a wine that seems tight and youthful. On the palate that picture of concentration is consolidated, with a raft of silky, dense black fruit and a polished, tight-grained cedary character. There are layers of wood smoke and liquorice-tinged, plum skin and espresso darkness, with a core of tight, muscular tannins and acidity. A very well-balanced and intense wine that needs a couple of hours decanting now, or a few years in the cellar. Excellent. £17.15, Laithwaites.